For anyone looking to learn paper piecing. For anyone wanting to improve their paper piecing skills. For anyone wanting to come sew this beauty with a group of friends! 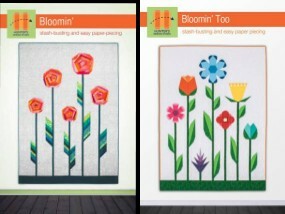 You get to choose between Bloomin' or Bloomin Too! by Sam Hunter for this class (included in your class fee). Finished size is 65"x85"
Easy paper-piecing with simple, straight-seam block construction the only skill required is decent 1/4″ seam accuracy. Come into the store the week before class to pick up your pattern and supply list! Before signing up for class, please check your schedule and read our class policy carefully. To be fair to our teachers and other students we must remain firm on our registration and cancellation policies. Cancellations must be made at least 7 days prior to class and you will be issued store credit. Our guest teachers reserve the right to cancel 48 hours prior to any class if the participation level is below any stated minimum. In the event of inclement weather, classes could have a delayed start time or be rescheduled for another day. If we are experiencing snow and icy conditions please check social media including Facebook and Instagram. This will be the quickest way to receive updates as the stores might not be open if road conditions are too dangerous for staff to get to the store to call or email you. We will issue a full refund for any class we cancel.